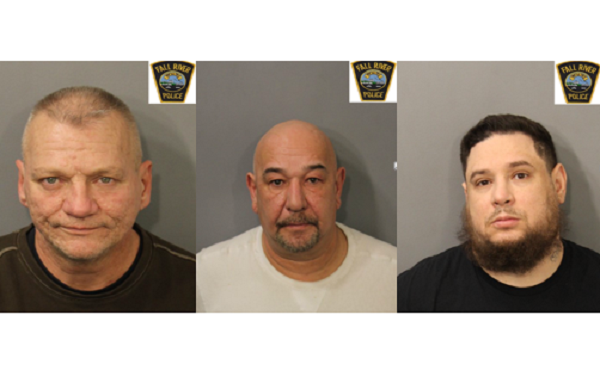 Fall River Police arrested three on drug charges in separate incidents last week. According to Detective John Robinson, on Wednesday January 30th, Fall River Police Department Vice and Intelligence detectives executed a search warrant at 258 Warren Street; Robert Delisle, 57, was the target. Detective Richard Aguiar was the lead detective with Detectives Gary Barboza, Paul McGuire, and Detective Sergeant Gregory Wiley assisting. During the execution of the search warrant, detectives secured Delisle and subsequently located seventeen bundles (eight hundred and fifty bags) of suspected heroin in a bedroom bureau along with a large sum of cash. Delisle, with a last known address of 258 Warren Street, was placed under arrest and charged with Possession to Distribute a Class A Drug and Distribution of a Class A Drug. On Thursday, January 31st as result of the Robert J. Delisle arrest, Fall River Police Department Vice and Intelligence Detectives executed a search warrant on a 2001 Buick Century owned by Delisle and its operator John Raposo, 51. Detective Richard Aguiar was lead detective, assisted by Detectives Gary Barboza and his partner K9 Capone, Heather Moniz, Paul McGuire, and Sgt. Gregory Wiley. Detectives located the vehicle operating on Broadway and with the assistance of Uniform Division Officer Alexander Aroujo, stopped the vehicle at the Elite Gas Station. During the execution of the search warrant, Detective Barboza deployed K9 Capone who began a search of the vehicle. K9 Capone alerted to the front seat of the Buick. Detective McGuire located a plastic bag containing bundled glassine bags with a light colored powdery substance inside. K9 Capone also alerted to a lint roller. Detective Moniz retrieved the roller and located a bundle of heroin inside the handle. A small sum of cash was also located. In all, 175 baggies of Heroin were confiscated. Raposo, with a last known address of 812 Charles Street #2, was placed under arrest and charged with Possession to Distribute a Class A Drug, and Operating a Motor Vehicle with a Revoked License. Also on Thursday, January 31st, Fall River Police Department Vice and Intelligence Detectives executed a search warrant at South Winds apartments 1 Rolling Green Drive apartment F; Miguel Saavedra, 37, was the target. Detective Gary Barboza was lead detective, assisted by his partner K9 Capone, Detectives Richard Aguiar, Heather Moniz, Paul McGuire, Sgt. Gregory Wiley and Parole Officers Brian McGaffigan and Richard Lyons. Parole Officer Lyons knocked on the door and identified himself as Rich. A female inside responded to wait a minute. The apartment went quite and no one responded to the door. Fearing destruction of evidence, detectives announced “search warrant” and entered the apartment. Saavedra and a female were detained in the apartment. During the execution of the search warrant, K9 Capone began a search and located a baggie of ‘rice’ stuffed under a recliner foot cushion. When questioned about the baggie of ‘rice’, Saavedra claimed it was ‘two bricks of heroin and a gram of crack’. Detective Sgt. Wiley located a small scale and Detective Moniz located a small sum of cash in a bureau. 1.9 grams of Crack Cocaine and 91 baggies of Heroin were confiscated. Saavedra, with a last known address of 1 Rolling Green Drive apartment F, was placed under arrest and charged with Possession to Distribute a Class A Drug, Possession to Distribute a Class B Drug and Violation of Community Parole Supervision.